The ReadingPen by Wizcom Technologies is an assistive technology device for dyslexia that can help children and adults access reading materials they might not otherwise be able to read. The ReadingPen scans text and converts it into a voice output. The pen and accompanying earbuds are well made. With practice, this assistive technology device works very well. The pen comes in a K-12 version and an advanced version suitable for high school, post-secondary, career or leisure reading. The ReadingPen gives users unlimited access to reading materials at home, school and on the job. With this product, users no longer need to wait for audio or digital versions of books and can access practically any book in any library as well as newspapers and magazines. The ReadingPen uses two standard AAA batteries and comes with a protective case. The device has a built-in speaker or may be used with the earbuds. The pen has a digital display that allows the user to choose which function to use and displays text being read. The pen includes a digital dictionary, thesaurus, functions and can read whole words and phrases and spell words. It also can give readers the definition of words, provide synonyms for words and translate words from Spanish to English or vice versa. This makes it a helpful tool for Spanish-speaking ESL students. The reading pen is a hand-held scanning device measuring 6.4" x 1.5" x 1" and weighing 3 oz. without batteries. 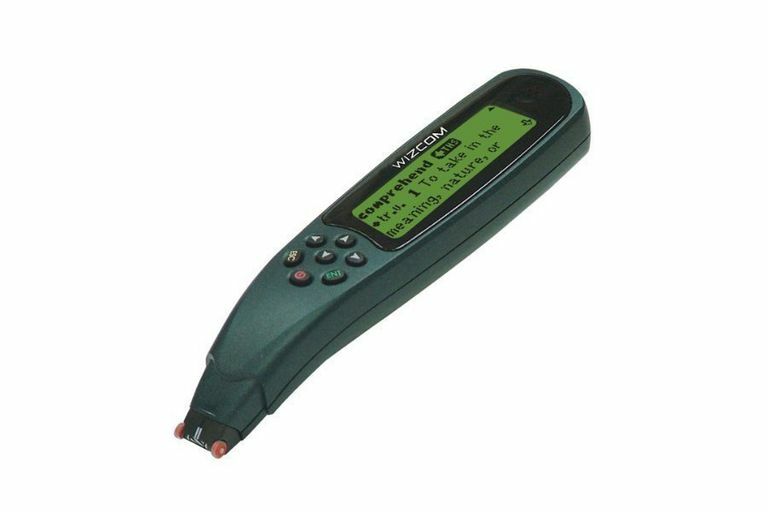 The product is UL listed and is an FCC class B device with 192KB RAM and 8MB ROM. The display is a monochromatic image with 122 x 32-pixel resolution. As noted earlier, the device has a digital voice output and can read words, phrases, and sentences. With practice, most students with learning disabilities will be able to use the reading pen with some practice and little assistance. However, students and adults with severe cognitive delays and significant fine motor weaknesses will likely struggle with this device. The pen comes in K-12 and advanced editions, and the earbuds provide privacy. In addition, the ReadingPen can be programmed for left or right-handed users. It reads words and sentences in an electronically generated voice. Users must scan the pen carefully across text for it to work correctly, so children with weak coordination may need practice with the pen. The same goes for people with physical impairments that affect muscle tone or ability to grasp objects. Another potential drawback is that the pen works best with standard fonts. It may have difficulty translating unconventional fonts. Sometimes the text is misread by the pen, and rescanning is necessary. This assistive technology device for dyslexia can help users read more independently. The ReadingPen may feel like a godsend for students with dyslexia and normal cognitive function who've struggled with reading for years. On the other hand, people with severe cognitive impairments will probably have difficulty using the device, so it should be reserved for individuals with typical cognitive function. How Is Dyslexia Diagnosed and Treated?